Most of us are familiar with that cute talking gecko on all the GEICO commercials. This little guy may be great at helping to boost car insurance sales, but can he be a good house pet? Absolutely! In fact, some would say that the gecko – particularly the Leopard Gecko – is the perfect house pet. 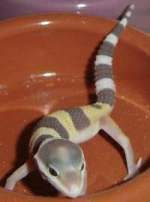 Though there are several species of geckos, the leopard gecko is the most popular pet choice for various reasons. These likable creatures are fairly docile, take up little space, require a simple diet, sport a huge variety of colors and patterns, and can live beyond 20 years, Wow! Having a gecko as a pet means having a nocturnal reptile that enjoys warm temperatures between 70 – 90 degrees Fahrenheit, as well as the company of at least one other of its kind. Ideally, there should only be one male per 15 – 20 gallon tank.